It’s not unusual for introspective indie songwriters to make forays into poetry. Some do it rather successfully, like Silver Jews’ Dave Berman; some, like Will Oldham, stir up the poetry world by turning against poetry. Then there are indie stars like the indefatigably youthful Thurston Moore—formerly of Sonic Youth, currently of Chelsea Light Moving—who was asked to teach at the Jack Kerouac School of Disembodied Poetics at Naropa University. 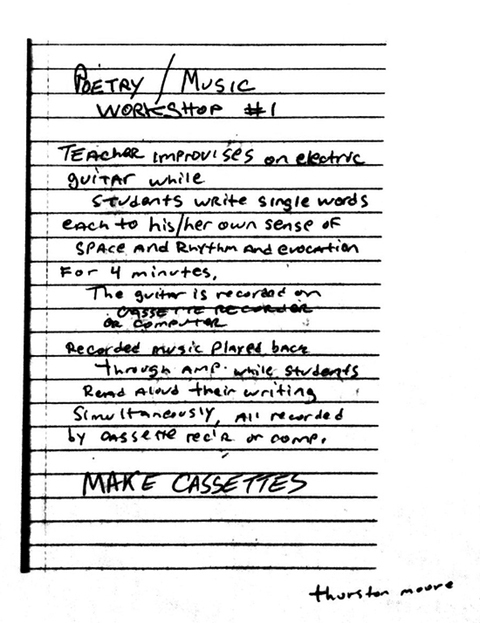 Better known for his numerous ventures in the New York experimental art world, Moore led a three-day poetry workshop at the Boulder, Colorado school’s summer writing program in 2011.
by cassette rec’r or comp. For instance, did you now that Kim Gordon had a texting relationship with James Franco? That Stephen Malkmus hates slam poetry? Or that even after years of being out of print, Moore's list of ten essential free jazz records he wrote for Grand Royale was still brought into record stores (Twist & Shout and Wax Trax included)? Moore had visited Naropa once before. In 2006 at a benefit for Burma Life and La Casa de la Esperanza, he read from his books Alabama Wildman, What I Like About Feminism, and Nice War and played some songs from Sonic Youth’s Rather Ripped. Hear the audio of that event above. 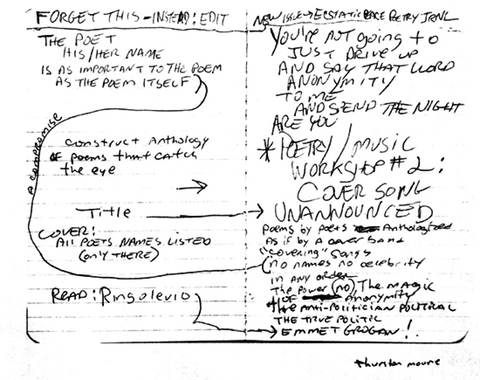 While the sentiment is kinda appropriate, this method is wrong on so may levels, i cannot even begin to say why teaching the writing of poetry does not belong in the hands of most musicians–even ones as creative as him. No method is wrong when it comes to writing poetry.